Near the small city of Burkesville, Kentucky, the Cumberland River boasts tall, steep, muddy banks, offers little public access and harbors a massive number of quality trout. We didn’t have a boat. Fortunately, we know Johnny Rush of Rainbow Guide Service, who has a boat. Rush has been guiding this stretch of the Cumberland for its still unappreciated trout (and stripers) for almost three decades and has a knack for always knowing where the trout are. This was the case Thursday when we were in town to film Pautzke Outdoors. Rush orchestrated a day to overcome thick morning fog, sweltering midday heat and humidity and looming late afternoon thunderstorms to hook us up with dozens of rainbows, a bonus brown and trio of brook trout. Rush is no newcomer to the Kentucky trout scene. He was born in this sparsely populated part of Kentucky, grew up casting the river, has tried every bait sold between the borders of The Commonwealth, yet chooses to use Pautzke FireBait exclusively. He’s so confident in FireBait, he wouldn’t even let me try our world famous Gold Label salmon eggs. Rush’s favorite color is orange, but he said if we made Kentucky blue he’d fish it daily. Meanwhile, a few days ago we caught fish on an array of colors, including Rainbow, Chartreuse Garlic, Feed Pellet Brown, Garlic Salmon Egg and Mallow Balls O Fire. The trout ranged from 12 inches on up to a few pounds. While there’s trout from Lake Cumberland to the Tennessee State Line, a distance of at least 50 miles, we stuck to drifting within five miles each direction of Burkesville, simply because that is Rush’s home base. The Cumberland River can be accessed from the bank where bridges and boat launches are found and near Lake Cumberland where there’s better bank access, but a boat brings easy access to literally hundreds of thousands of trout. 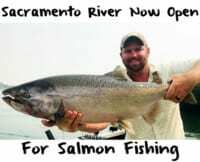 There’s trout throughout the large section boasting 50- degree water, healthy hatches and big trout. 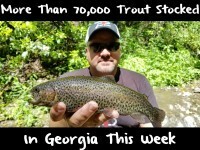 It’s one of the best trout fisheries in the South. We kept things simple and drifted FireBait on a Eagle Claw treble hook, fished on 8-pound test with a single Water Gremlin split shot. There’s no need for fancy setups. Keep it simple and you’ll catch trout. Lots of them. While we did catch trout throughout the day it becomes less enjoyable from 11-3 when sweltering temperatures aim at pushing you to the bank for a few hours. The early morning (there will be thick fog most likely) and late afternoon/evening bite shine and will keep your rod pinned often. 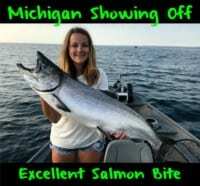 On this trip, and during most outings, except to catch more than 90 percent rainbows, many of which will be two pounds, display vibrant colors, full tails and fight well. While browns aren’t normally caught on dough bait, we managed one and to everyone’s surprise three brook trout, all about three-quarters of a pound. The Kentucky Department of Fish & Wildlife has stocked the brooks for a few years now and they are starting to populate the river. Meanwhile, rainbows still dominate the scene. Editor’s Note: For more info on Johnny Rush’s guided trout trips please call 270-459-0621. To view a video about trout fishing the Cumberland River with Rush click on the link below: https://www.youtube.com/watch?v=buSHYC6Hyoc.